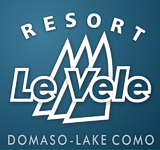 Welcome to the Resort Le Vele web page. The Camping is in Domaso on the Lake of Como, a place to spend your holidays in an exclusive setting, equipped with a fitness centre, wellness centre and a 200 m2 swimming pool. What do you want from your holidays? Rest, entertainment, doing your favourite sport, enjoying unspoilt nature, toning up your body? We can offer you all of this. The exclusive area Fitness / Relax is equipped with hydromassage showers a turkish bath, a sauna and a whirlpool Jacuzzi ®.